What kind of side dish looks nice and special but is very simple to make? Hot soup is a good answer but something fatty will also be a good choice, as long as it’s very delicious. Spicy-stir fried pork is the perfect dish that I was thinking of. Just follow the recipe and make a delicious, irresistible, spicy, shiny, stir-fried pork dish in 15 minutes! I posted the video and the recipe years ago on my website, and it’s also one of my cookbook recipes, but this updated version is slightly modified and improved. This time I used pre-cut pork sold at a Korean grocery store, but you can also just get pork belly at your local butcher and cut it into think pieces about 1/8 inch thick. You could also replace pork belly with chicken breast, slightly frozen so you can slice it thinly and nicely. Heat up a large, thick skillet (or pan) over medium high heat. Add pork, hot pepper paste, soy sauce, sugar, hot pepper flakes, black pepper, and sesame oil. Mix it well, stirring with a wooden spoon. 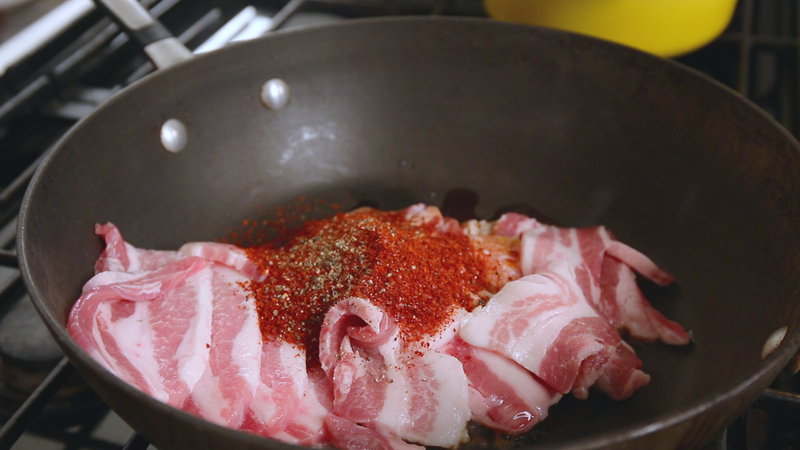 Cook it for a few minutes until the pork is well mixed with the seasonings. Add garlic, ginger, onion, and green onions. Stir and cook for 12 to 15 minutes until the pork is fully cooked and juicy and a little crispy. 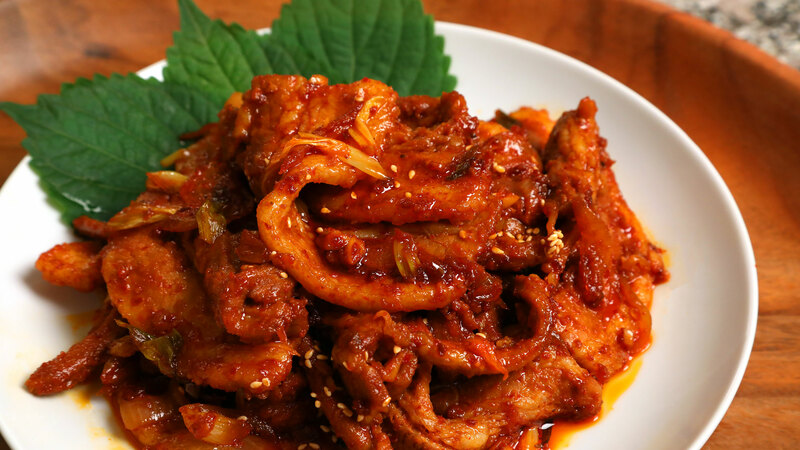 Transfer to a serving plate and serve with rice, kimchi, lettuce, ssamjang, and more side dishes. Posted on Friday, September 3rd, 2010 at 10:39 am. Last updated on November 7, 2017. Posted October 31st, 2018 at 3:16 am | Log in to reply. Posted November 16th, 2018 at 8:20 am | Log in to reply. I’m glad you enjoyed this dish! Posted April 3rd, 2018 at 8:18 pm | Log in to reply. I made this last week…. It was DELICIOUS! I’m in the military and spent a year in Korea. The one thing I miss most is the food. I appreciate you posting these recipes. Brings me back! Posted April 14th, 2018 at 9:27 am | Log in to reply. I’m glad you like my recipes. You went to Korea to protect my country, but you fell in love with our food. I lived in the USA, and then once I went back to Korea I really missed some American foods, like salad. We have something in common! Posted December 27th, 2017 at 11:39 pm | Log in to reply. This was amazing. You are amazing. Posted December 27th, 2017 at 3:16 am | Log in to reply. Posted November 18th, 2017 at 4:30 pm | Log in to reply. I love Your recipes! Ever since I started following Your blog, my cooking became so much better! This recipe is probably the easies I’ve done so far. As a dinner, I made it with 밥, 통배추김치, 흰무 (I’m not sure if it’s correct name for pickled radish) and my favorite 녹차라떼. Posted November 20th, 2017 at 10:09 am | Log in to reply. Posted November 14th, 2017 at 10:52 pm | Log in to reply. Posted November 9th, 2017 at 12:33 pm | Log in to reply. Posted November 9th, 2017 at 12:27 pm | Log in to reply. I like to add kimchi to mine. I normally use some of the fresher kimchi but still sour. This one is with onion, green gochu and kimchi. Posted November 20th, 2017 at 10:12 am | Log in to reply. It looks great! I sometimes make it this way, too! 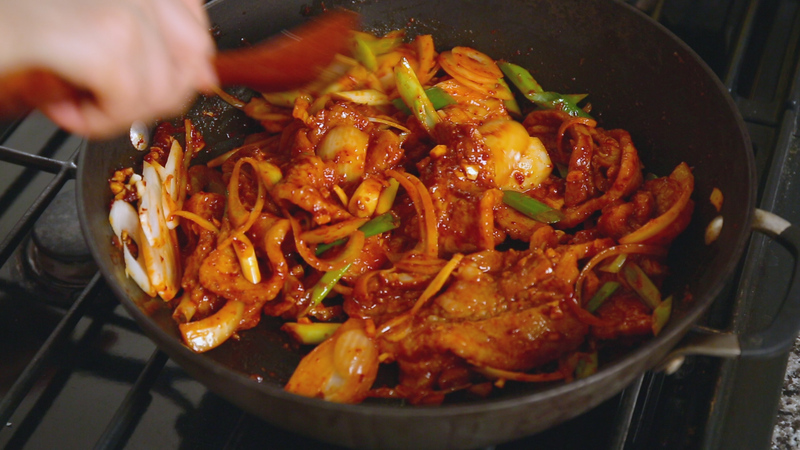 Stir fried kimchi and pork, which is another recipe I will post someday! : ) Yours looks so good! Posted August 14th, 2017 at 7:27 pm | Log in to reply. Hi after watching your cooking show, I tried this recipe because I had all ingredients in the house. It turns out pretty good, very tasty. I like your show, teaching, funny and after cooking you show how to eat with your dish. Posted May 30th, 2017 at 4:50 pm | Log in to reply. I just found your videos and this was the first recipe I made myself – it turned out lip-smackingly good. Will be going thru a lot more of your recipes! Thanks! Posted January 21st, 2017 at 3:05 pm | Log in to reply. Hi Maangchi, this is so delicious and I’ve been making it so much! My cooking time has been longer than yours, but I’ve been using a whole pork belly around 3.3 lbs every time that I’ve made the recipe. Posted March 9th, 2016 at 4:51 pm | Log in to reply. Whenever we cook porkbelly that we bought here in the US (from Costco) it’s tough. What are we doing wrong? Posted May 13th, 2016 at 8:01 pm | Log in to reply. All meat will be tough if you cook it wrong. Start out with HIGH heat and braise it then once its braised cook on low heat. Meat only gets tender on low heat. Posted September 26th, 2015 at 7:40 pm | Log in to reply. Posted July 26th, 2015 at 8:57 am | Log in to reply. Hi Maangchi! I have been using your recipes for over 5 years! I always make this recipe for just my husband and me but is there a way I can decrease spiciness without making it bland? Should I add 된장? I just don’t know how much! Please let me know if you can. Thank you! Posted July 28th, 2015 at 9:52 am | Log in to reply. Use less hot pepper paste and add just a little bit of soy sauce according to your taste. Good luck! Posted July 19th, 2015 at 9:08 am | Log in to reply. I used pork shoulder this time, since I couldn’t find good pork belly. Happy with the result, it was very tasty! Posted July 19th, 2015 at 10:38 am | Log in to reply. 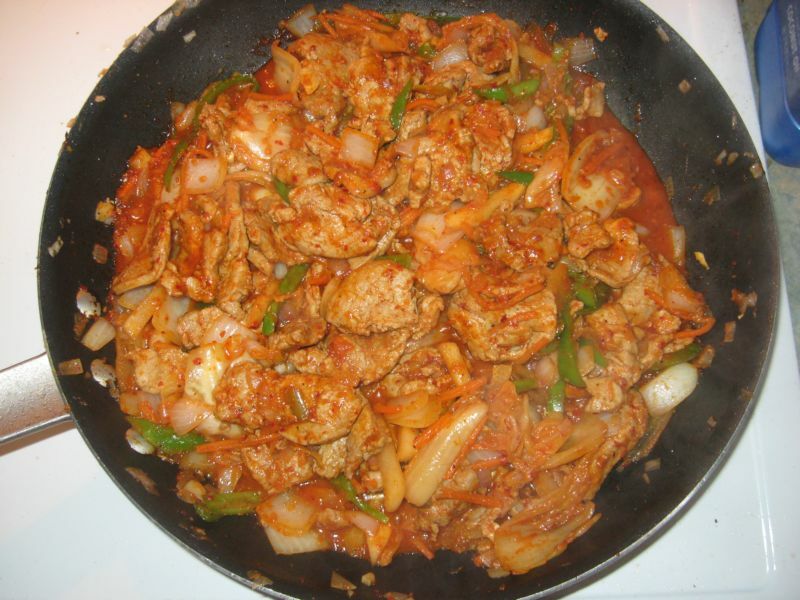 This recipe was originally posted on September 3, 2010 at 10:39 am by Maangchi. It was last updated on November 7, 2017. The video was watched 538,269 times on YouTube & has 14,952 likes! This video is a remade version of an earlier recipe. The original video was posted on 2010-09-03 and has 1,595,763 views.